Everyone says money! How much is enough to take care of you for the rest of your life? Do you have a number? Does it cover inflation, medical insurance and all your “needs” and your “wants”? Fidelity says you should have at least 8 times your ending salary! Whatever you think, you need to add ten percent! Why? You probably underestimated how long you may live. How do you figure out how much you need for the rest of your life? A lot of people say they need one, two, three million dollars. In other words they back into the yearly amount of money they need to live. Some people take their current earnings times 30 or 40 to find what they need. This does not include inflation or the things like travel or other activities that may occur during retirement. Most retirees expect to be active, travel, participate in a lot of activities and do a lot of things with friend s and family. You must consider you will have a lot more free time if you are not working. Do you plan on retiring early? Start planning your retirement now! What do you want to do? How much money will you need to maintain your lifestyle? For example, how much will you travel? Would you visit relatives, your children, grandchildren or just travel? How often? How long will be away? Will you stay in a hotel? How much money will you spend while you are away? What activities will you like to do? Do these activities cost money? Will go out to lunch with friends every day? Will you golf or play tennis every day? Have you thought of everything? Probably not! Add ten percent to your number. Now you have a good estimate of how much you will need. Your estimate should be about 25 times your first year’s expenses. That portfolio will last about thirty years. What is next? How are you going to accumulate the money to support your retirement? Win the lottery? I don’t think so! Your retirement savings will probably encompass a 401K, IRA, Roth IRA, brokerage account, real estate, and cash. In addition, some may have a business, income property, pension or Social Security. Inflation can reduce your nest egg as much as a volatile stock market! An average of 3% inflation per year means your cost of living will double every 24 years. Don’t forget medical insurance increases faster than the inflation rate. Start saving early! If you have a retirement savings goal of $1.5 million (25 times $60,000), the earlier you start to save the more likely you will reach your goal! You can contribute as little as $3,000 per year (that’s less than $10 per day) and have $1,615,440 based on a 7% return. When you start your first job, enroll in the company 401K. Your company may have a match, or it may not. Don’t let that stop you from having a 401K. The principle advantage of a 401K is having your retirement savings grow tax deferred. In other words, pay taxes based on your tax bracket when you start withdrawing from your 401K in retirement. Open up a Roth IRA too. Contribute as much as you can. Roth funds grow tax free. Saving for retirement requires the same planning as living your life. A budget is essential for living and retirement! Budgets are used to help you reach your financial goals. Developing a financial plan for retirement will be even more important because you will have less time to generate your savings again. What is your vision of retirement? What do you expect to do to keep interested, stimulated and happy? I talk to people every day about this very issue. It’s easy to skim over/ignore these articles and plan to start ‘next year’ or when ‘finances improve.’ Your advice is spot on Krantcents. Even if starting now means saving a little and increasing slowly, it WILL make a difference. Small changes work! If you invest as little as $10 per day, you could have a fortune by time you retire. It is so important to start planning and saving for retirement as soon as possible to maximize the power of compound interest. Equally important is to keep adjusting the plan to meet the changes that occur throughout life. So true! The last few years are examples of times that require adjustments in your plans. Thanks, you made me and probably a few other older people smile! Might go broke in the process too if you have kids though! I think it depends when you retire. Yes, it does take planning for those additional expenses. True. Remember, you can’t take your wealth with you. Side note: 2011/12 is the rare $5 million gift tax exemption window. Perfect time to splurge on your grandkids. 25X expenses sounds like a good multiplier if the interest rate risk free return was 4%. Unfortunately, we’re more like 2.5% now… so it’s closer to 40X! It is good I have multiple income streams. Absolutely love the picture KC! Thanks, please note it is not me in the picture! I agree- supportive children (and you need to make sure you nurture them, or else they won’t come to take care of you when you’re older and ailing)… money also helps too! Friends and family are very important in living a long and happy life. Money just makes it easier! I do not have grandchildren yet, probably because my children are not married. BTW, I am still working on having enough money for a long retirement. I hear so many rules of thumb …. 25 times your annual expenses, or 33 times your annual expenses, or 80 percent of your pre-retirement salary … suffice to say you need A LOT, and you’ll probably never regret having saved too much. True! Multiple sources is good too. I will have Social Security, pension, 401K, 403B, IRA, Roth IRA and a brokerge account. I think money is obviously a very important thing to have in retirement. However, I think focusing on keeping yourself healthy while you are young and into your ‘older’ years is equally as important. 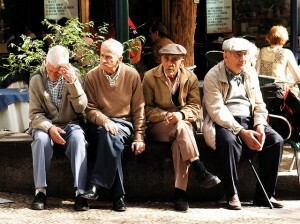 A healthy lifestyle which includes staying fit, having friends, and socializing contributes to a long life. I really don’t know how much would be enough. In theory I’d like to work in the rat race for 20 years and then call it quits for a while, but heck it’s already been 15. Thank god I started saving since that first paycheck because time really does fly by fast. Our kids will still be in grammar school, so there’s those expenses to think about too. I wish I had a magic number that would make me warm and fuzzy, but part of me thinks it’ll always be about double what I currently have. It is a personal choice, but determine what you need so you can work for it! Remember this is not a five minute exercise, spend a lot of time and effort to reach your goal. What do you need to retire? A plan! It is good that you have mentioned multiple sources of income several times. I totally agree. Stocks that pay dividends, income producing real estate, passive income from a business or blog are all sources that should be considered in a retirement plan. Don’t forget Social Security! We have seen recently how economic factors can affect investments and income. This is additional reasons for multiple income streams.